Clash of Clans Milking Farming Strategy : Clash of Clans is one of the most played games on smartphones and tablets. Those who play this game really love this strategy platform handheld game. This game has millions of users on different platforms like Android and iOS. We all know that this game has rules and many strategies to achieve a victory over our opponent. But the game is not only about achieving trophies but also gaining loads of loots. Raiding a base just to get loads of Elixir, Gold and dark Elixir is what we want sometimes. There are many strategies to raid a base with Good amount of loot but today we will talk about the latest strategy of Farming called “Milking Farming strategy”. Since the update in December it is hard to raid a base with good loot but now with Milking farming strategy you can now get 100K or more amount of loot again. This strategy is invented by a player of Clash of Clans. Not every Clash of Clans users know about this strategy yet. So you should feel proud of yourself about knowing this strategy before your friends do. Milking Farming strategy can work on any Town Hall Level and you can get up to 1 million of Elixir, gold and dark elixir each in around 30 minutes if you play it continuously. PC Users get this one to Install Clash of Clans for PC Windows(10/7/8.1/8/XP/Vista)/Mac Laptop. Do you know How to Use WhatsApp Without Mobile Number/Phone Number. What to do for Milking Farming Strategy Clash of Clans(COC)? Make as much as Goblins in your barracks. Although level 5 or more Goblin is preferred but if you feel like a player you can also use less than level 5 Goblins also. Make around 6 to 10 Wall breakers so that it can make way for your Goblins. But if you want to get resources and go for raid in every 3 minutes you can skip the Wall breakers as they will take time to get ready. Use your Archer queen to Attack at the buildings and defenses so archer queen with high level is preferred. Now what is the use of the spells? Spells will give you assistance from above like the poison spell will help you to poisoned the Troops in the clan castle. 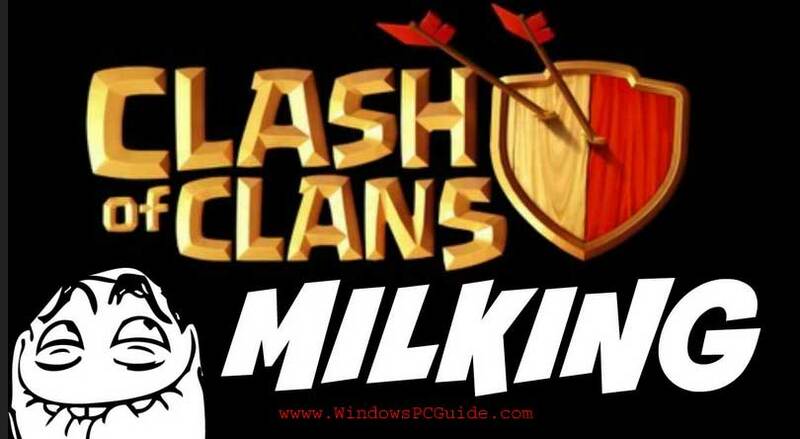 Before going in detail about clash of clans milking farming strategy between are you searching for Clash of Clans(COC) installation without bluestacks then you are here Clash of Clans(COC) for PC/Laptop Without Bluestacks on Windows 10/7/8.1/8/XP/Mac. The Jump spell will make your Goblins jump over the wall so that they won’t face any resistance and can straightly start collecting loots for you. Now train your troops and start raiding your opponent’s base. Trick to Use Two Clash of Clans in One Android/iOS/Blackberry/Windows Phones. Bluestacks Alternative : Droid4x Offline Installer for PC Windows(10/7/8.1/8/XP) Laptop. League – Milking Farming Strategy will work best in Bronze I to Silver III because in this league there will be lots of inactive base with good loot. So keep an eye on them. Targets – Usually target those bases in which the Collectors are filled with resources so that you can get half of the available loot by just attacking at the Collectors in the Base. So this was the Milking Farming Strategy. I hope this article help you in raiding with the strategy.